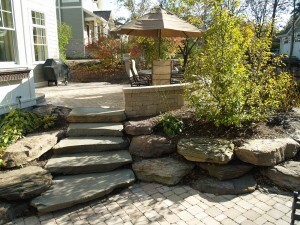 Landscaping steps can be constructed from several different types of materials. 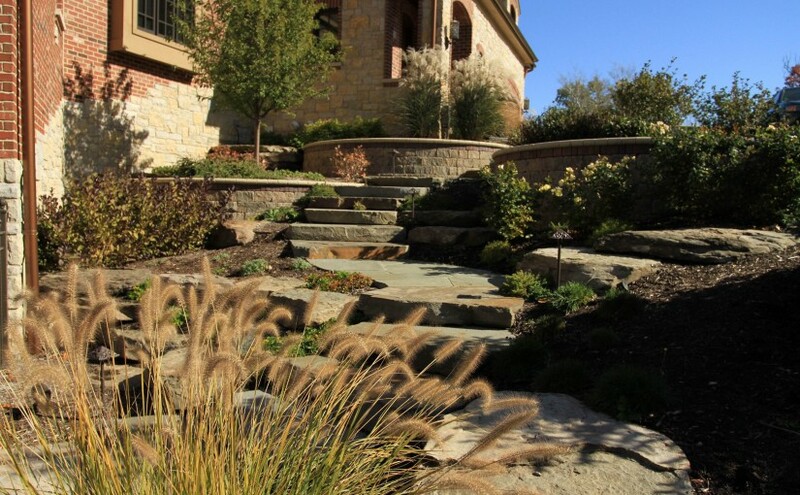 However, regardless of the type of material that is used, landscaping steps all serve the same basic purpose — to provide a safe and beautiful transition between two different grade elevations. 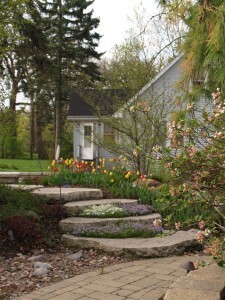 Before you select the type of landscaping steps to incorporate into your landscape design, there are three important things you should consider. Amount of traffic and use. Consider the amount of foot traffic, type of use and frequency of use. Ask yourself the following questions before making a final decision on the type of steps to use: Are there small children or elderly that will be using the steps? Will the steps be primarily decorative? 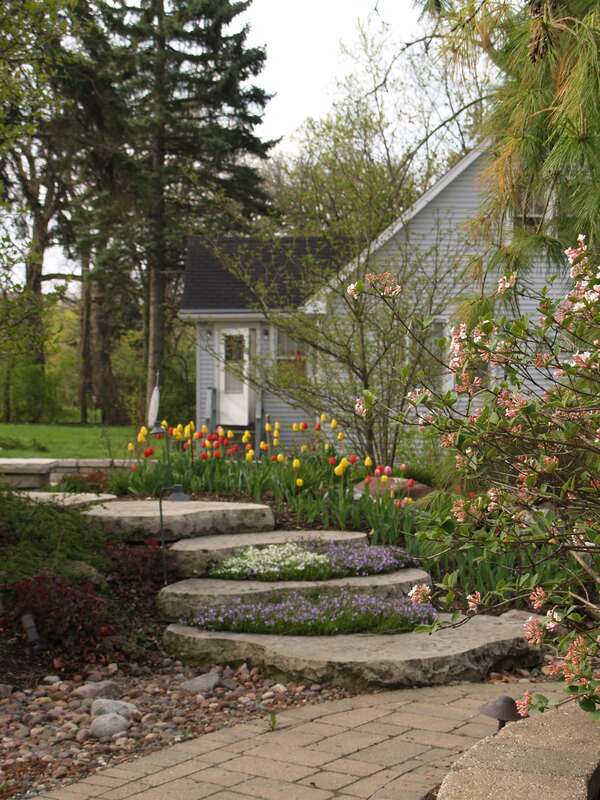 Will the steps be used as a landscaping focal point or garden piece? Type of step construction. There are three basic types of materials used in step construction. Brick or stone adhered to a concrete substrate, solid stone or concrete step units stacked on top of one another, and steps constructed of retaining wall or natural stone to make a stair assembly. The latter type of construction can be problematic due to blocks coming loose or due to improper compaction of gravel fills which can cause settlement. Know your state and local building codes. One of the biggest concerns we hear from clients is that their current steps aren’t safe. Steps need to be equal in rise (in the range of 5 ½ – 7 ½”) with a tread run of 10 – 16”. If you are connecting an entry with a patio or walk, you should be sure the steps are safe, comfortable, and in accordance with local building codes. Most applications require a large platform to step onto before stepping down to the next step or surface. By code, this platform is generally 36” deep and at least as wide as the doorway. Also, when you have more than three risers in a stair assembly, be sure to check the building codes to see if railings are required. Landscape steps are one of our favorite elements to incorporate into an outdoor setting. We can provide many options and are educated on all relevant building codes. Contact us for a free on-site consultation to discuss your stone and hardscape needs. Want to know more about landscape steps and finishes? Bookmark our landscaping ideas page and check back for an upcoming post on how to construct concrete landscape steps with a beautiful brick or stone finish.